Secular humanism is toast too? Atheist philosopher John Gray thinks so. I have a question about this. Let’s assume that the universe IS an Avida like program. That means that humans are a product of the algorithms of it and therefore do NOT create new information. Even code is not “new information”. This seems to make the whole concept of information a self-refuting. That also means our own algorithms from within the system do not create new information. So therefore, if by the world-view of the athiest, you just proved not only that human beings do not create new information, which destroys the positive case for intelligent design, but it also seems to show that information doesn’t even exist in the first place. Can someone tell me where I have gone off track? 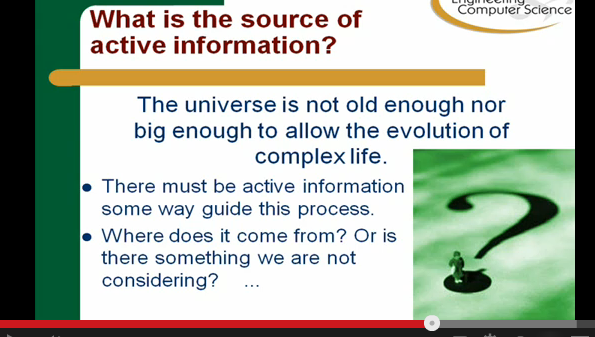 Hmmmm, how about “information doesn’t even exist” is information. If you count being self-referentially incoherent as going “off track,” that might be a place for you to start looking. I mean that still didn’t answer my question. If the supposed “God” made this universe than it would be that of the Avida program or similar. If we see that within the Avida program information is not created than how can we assume we create information if we live with-in a similar system. It’s a paradox that is quite nerve racking and I would appreciate a less sarcastic response. I have been too busy to monitor this, forgive that. I will say that you start with an assumption that is deeply questionable, so the problem is the assumption not its implications. Every worldview must stand on its own bottom and any worldview that implies that like the matrix the world we live in is a grand delusion, decisively undercuts its own self, as it undermines trust in our minds, senses and consciousness. Such can be ruled out as not credible absent direct evidence which by their very nature they undermine, and so they are self referentially incoherent. We need not worry about such. I suggest that no material, algorithmic or chance driven and/or merely mechanically necessary system is capable of generating FSCO/I, so that the very existence of this — cf the posts in this thread — is evidence that there is more to reality than such things want to imagine. Using your mind to imagine and construct a notion that undermines the mind, is its own refutation. So BA’s comment that your very statement of denial is illustrative of the self referentiality and self undermining, is apt. And, we see one of the uses of design theory, it puts us back in a reasonable domain of thought where our mindedness is significant. So we as humans are creating information? What if you could design a computer program so that it could create intelligence. And that intelligence started creating. Is it only at that moment that information is being created from within the program? I wouldn’t so much say that humans create information as say that humans are a conduit through which information can enter this universe that otherwise wouldn’t be here. IMO, humans draw information from an unlimited source and instantiate it into physical representation here. Electrical genius Nicola Tesla was born in Serbia in 1856,,, his father was a clergyman. Excerpt: While walking in Budapest Park, Hungary, Nikola Tesla had seen a vision of a functioning alternating current (AC) electric induction motor. This was one of the most revolutionary inventions in the entire history of the world. At the 11:50 minute mark of this following video 21 year old world Chess champion Magnus Carlsen explains that he does not know how he knows his next move of Chess instantaneously, that ‘it just comes natural’ to him to know the answer instantaneouly. Excerpt: What’s the secret to Magnus’ magic? Once an opponent makes a move, Magnus instantaneously knows his own next move. Excerpt: Because normal children struggle to learn multiplication and division, it is surprising that some savants perform integer arithmetic calculations mentally at “lightning” speeds (Treffert 1989, Myers 1903, Hill 1978, Smith 1983, Sacks 1985, Hermelin and O’Connor 1990, Welling 1994, Sullivan 1992). They do so unconsciously, without any apparent training, typically without being able to report on their methods, and often at an age when the normal child is struggling with elementary arithmetic concepts (O’Connor 1989). Examples include multiplying, factoring, dividing and identifying primes of six (and more) digits in a matter of seconds as well as specifying the number of objects (more than one hundred) at a glance. For example, one savant (Hill 1978) could give the cube root of a six figure number in 5 seconds and he could double 8,388,628 twenty four times to obtain 140,737,488,355,328 in several seconds. Joseph (Sullivan 1992), the inspiration for the film “Rain Man” about an autistic savant, could spontaneously answer “what number times what number gives 1234567890” by stating “9 times 137,174,210”. Sacks (1985) observed autistic twins who could exchange prime numbers in excess of eight figures, possibly even 20 figures, and who could “see” the number of many objects at a glance. When a box of 111 matches fell to the floor the twins cried out 111 and 37, 37, 37. I have a fundamental belief in the Bible as the Word of God, written by men who were inspired. I study the Bible daily…. All my discoveries have been made in an answer to prayer. What I also find interesting is how the search for a search that can find the target is at least as difficult a search as the search itself – targetting a search that can target the information. If that is true, one wonders how difficult it would be to find a search process that can produce virtually unlimited amounts of information as humans can apparently do. Any of us can trivially throw out immense strings of specified information (as text) beyond the beyond search capacity of billions of universes, and yet finding just such a search mechanism (as if Darwinism was ever up to the task) is at least as hard as the search itself. That capacity in itself, it seems to me, directly implies that humans have access to a non-physical, unlimited source of information, and have a spectacularly unlikely means of instantiating it into the physical world as thought, text or spoken word. S4S implies an incremental scan of the power set of a set — its set of subsets. Cardinality of a power set for a set with n members is p = 2^n. Where of course the match between spaces and possible search algorithms becomes a real headache. Some searches will even be anti-searches. 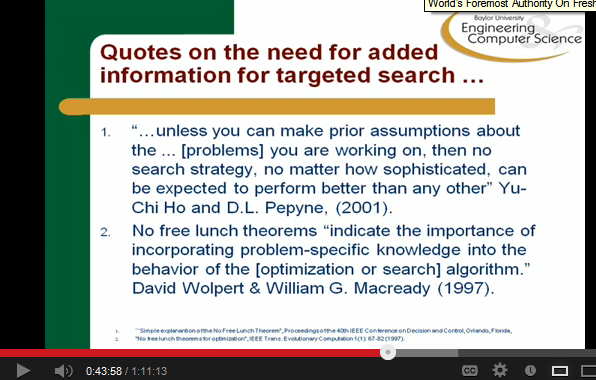 Substituting a blind search in the power set is not going to be a better answer, period.